The pre-Columbian Casma State dominated over 300km of the North Coast of Peru in the early second millennium AD. Following years of research at the Casma capital El Purgatorio, David Pacifico presents recent and future research plans for exploring smaller settlements in the Casma heartland. Pacifico’s research includes pedestrian survey, collaborative GIS analysis, and future field archaeology in El Purgatorio’s hinterland. 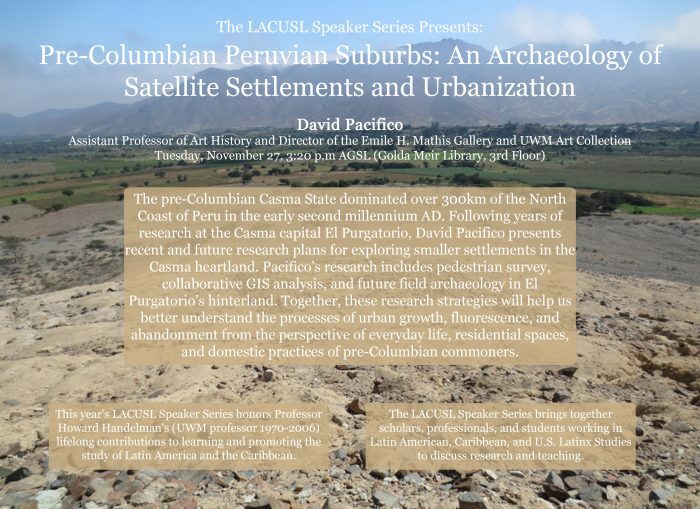 Together, these research strategies will help us better understand the processes of urban growth, fluorescence, and abandonment from the perspective of everyday life, residential spaces, and domestic practices of pre-Columbian commoners.